Alfred Jensen is an abstract visual artist known for his large canvases of numbers and thick, deep color that very personally reveal the iconography of his perceptions of the universe. He took up Suburban fatherhood late in life, at the age of 60, after years of trans-continental, passionate drama and introspection. The experience surprisingly led to a quieter vie quotidien à la Glen Ridge New Jersey, where his mathematic visions fully came into view on the canvas. And although his paintings are technically classified as abstract impressionism, the concrete nature of his observations — both mathematic and physical — lead his work to practically fall into a category all its own. Alfred began his life with Cosmopolitan roots. He is the product of a Danish father and a German-Polish mother who had found themselves in Guatemala by chance: his father was a contractor and furniture maker, having abandoned the search for riches in the California gold rush and his mother as a governess to a French family. After losing his mother at the age of 7, Jensen moved to Denmark under his uncle’s care to attend school. It is as a school boy that he learned his penchant for portraiture. The need for money after graduating from school led him to a post as a cabin boy on a ship and he travelled extensively and worked as a seaman for the next ten years. He continued to draw portraits of the crew and passengers, but most importantly, “listened to the wind and looked at the natural phenomena of life which is necessary to the development of an artist.” (www.alfredjensen.com). Learning that his father was on his deathbed, he disembarked in California and headed back to Guatemala on foot, but wasn’t granted passage trough Mexico. He instead set down stakes in California, making his living as a rancher and chicken farmer, but all the while honing his power of observation and painting “murals of my chickens. I drew hundreds of chickens. I found that every chicken had it particular character.” (Irving Sandler and Michael Torlen, Interview with Alfred Jensen (Glen Ridge, New Jersey, 15 May 1975), unpublished, n.p.)). He began to study art in San Diego in the twenties, as Peter Perrin notes, and then traveled to Eurpose to workd under more established artists in Munich and Paris. In 1927, Jensen met the American footwear heiress, Saidie Adler May. May was an avid collector of surrealist and abstract expressionist works that she would ultimately bequeath to the Baltimore Museum of Art. Jensen was 24 and May 48 when they met but they lived and circulated as a couple in artistic circles until her death in 1951. After May’s passing, Jensen slowly developed a reputation among artists and was followed by collectors. In the sixties, reversing the “May – December” relationship with May, he married he younger artist Regina Bogat and became a father for the first time at the age of 60. (from All the Beautiful Systems: Alfred Jensen, by Peter Perrin). Many of his works currently on exhibit reflect Jensen’s vision of governing systems of the universe which derive from his worldly background. Yet his later works exhibit a more metaphysical appreciation of the intangible makings of his surroundings. Jensen was omnivorous. He consumed ancient Chinese calendars, the I-Ching and magic squares, alchemy, astronomy, Mayan calendars and counting systems, Egyptian temple design, physics, Inca ruins, Greek philosophy and golden sections, Pythagoras, Plato, Leonardo Da Vinci, Neil Armstrong, Goethe, Faraday… Jensen was wild and fancy-free in creating correlative systems. He mashes ideas together, transposes them, overlays them, cross-pollinates them, all to find common order, a deeper structure. (Reflections on Alfred Jensen, by Chris Martin, from The Brooklyn Rail, Jan/feb 2002). One such work, The Substance Out of Which The Universe Is Made, can be found at our own Montclair Art Museum, which is currently exhibiting Patterns Systems Structure: Abstraction in American Art. Drawing from the principles of quantum physics, the ancient Mayan calendar as well Christian tradition, Jensen presents a tableau that is more diagram than visual sensation. A sense of order is conveyed to the viewer from the concrete rendering of what Jensen appears to reason: that substance coexists in physical and metaphysical systems, and is presented in black and white opposing blocks of odd and even numbers. Texts from the bible and a textbook of quantum mechanics are included, all centered around the all-important Mayan number 819 (according to some calendar inscriptions from pre-Columbian Meso-America, the calendar was based on a 819-day count). It was painted at the end of his life, in 1978 when his children, aged 13 and 8, were happily ensconced in their suburban classrooms and Jensen was three years away from putting down his paintbrush for good. Perhaps sensing that the end of his life was near, his paintings grew more and more abstract and spiritual, a natural progression for one ensconced in fatherhood as a wise and experienced man who had seen the world and conjured his own sense of it. A once restless bohemian existance found its culmination in a suburban family life that ultimately led to him finding his voice. The voice seemed to utter: we have a place in the universe, and it revolves around love. His 1975 The Family Portrait centered the names of his beloved family members amongst patchwork quilts and trigrams from the I Ching (one of the oldest classic Chinese book of divination systems) signifying father, mother, son and daughter. He uses he same red as he did in a previous work, Solar Energy Optics. The artist himself described the painting as “a side trip into the dualities, as [English electricity pioneer Michael] Faraday saw the physical realities of positive and negative electricity, so the everyday life is the positive and negative actions of the family, the father and son and the mother and daughter.” (www.alfredjensen.com). Representing the more traditional second life of Alfred Jensen, this painting nods to the more cosmopolitan life with his Saidie May when these systems were recorded photographically in his mind. They were recalled in such paintings in his second life, seemingly ordered, with Regina Bogat, a renowned artist in her own rite. 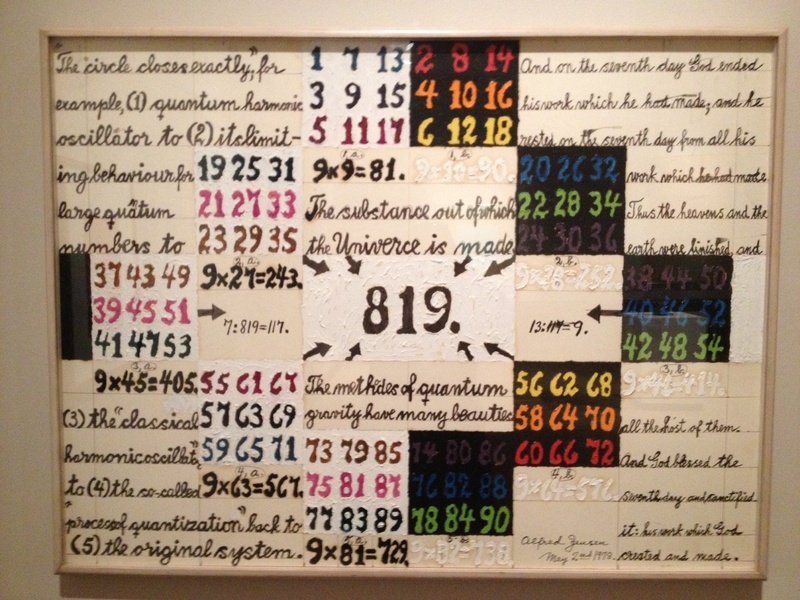 With Regina, Alfred Jensen realized a type of painting that according to him conveys the “idea of correspondence [which] has great significance and replaces the idea of causality, for things are connected rather than caused. Thus lovely things summon others among the class of lovely things, repulsive things summon others among the class of repulsive things. This arises from the complementary way in which a thing of the same class responds. This idea that things belonging to the same class resonate or energize each other has guided me.” (www.alfredjensen.com). The connection of the abstract to the concrete comes with beautiful results, and as his beloved Peter eloquently critiqued in a Glen Ridge New Jersey school house in an assigned biography in the 1970s: “My father is good and strong because he paints solar energy.” (http://www.alfredjensen.com/writings/statement1977.html).